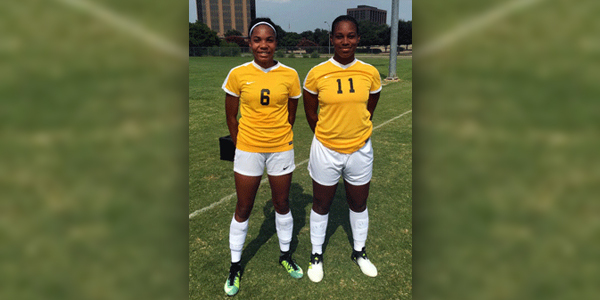 Brookhaven College hammered Cedar Valley College by a score of 9-0, with two Bermudians — Deshae Darrell and Micah Pond — contributing to the goal tally. Savanna Hernandez opened the scoring after only 40 seconds, and Hernandez was on target again after some sloppy defending allowed her to win the ball. A minute later Darrell made her mark on the game after some brilliant play down the left flank by Hernandez allowed her to cross to the ball to Darrell in the penalty area who made no mistake with her finish. Darrell would find the back of the net again in the 10th minute, and in the 23rd minute, Hernandez was able to power the ball home for her first hat trick for Brookhaven. In the second half, Brookhaven were on the scoresheet again when Ortega found Taylor Reyes unmarked at the back post with a great cross. Bermuda’s Micah Pond then got on the scoresheet when a corner kick from Reyes found the head of Pond, who made no mistake with a powerful header. Brookhaven would then finish off the scoring through Joseline Sorto and Olivia Marin in the 69th and 75th minutes respectively.